Pacific Rim Movie – Your Opinion – T.D.G. Posted on July 13, 2013 October 24, 2015 by Tom G.
When I first saw commercials for this movie I knew I had to see this movie when I comes out. My Son and I are both huge fans of “Mechs” like in the game Mech Worrior or in one of my all time favorite pc games ever Battlefield 2142. I also had the chance to be a beta tester in the all Mech online play-for-free game HAWKEN. You can say I am a nut for any game where you can play a huge robot and explode crap all over the place. I this movie I can’t operate the Mechs but I can be happy with just watching it on a bug screen at theater. If you saw this movie lease tell me what you thought of it, is it worth seeing? Is it as good as it looks? I tried to find my friend who always has bootleg dvd but I could not find where he is hanging out these day. He might be in jail…lol. 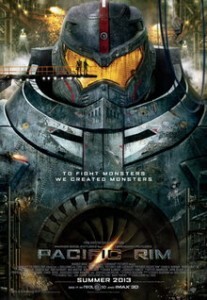 Check Out Movie Trailers: Pacific Rim – Featurette – Jaegers: Mech Warriors on Hulu. Check Out Movie Trailers: Pacific Rim – Trailer on Hulu.